Munsell Plant Tissue Color Charts has an update in the works. As an important resource for identifying plants, we want your input. If you are a botanist or other plant professional, you know that plant cell coloring is a key factor when determining the type, age and identification of plants. 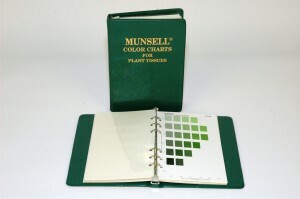 Have a great experience using Munsell Plant Tissue Charts? We’d like to know about it. What’s Your Experience with Plant Cell Coloring? You know plants. We know color. Together, we can improve how plant colors are used for diagnosis and identification. The Munsell Plant Tissue Color Charts specifically targets botanists and others who need consistent color terms for identifying plants by leaves, stems, or other color variants. Now it’s time to refresh the book, adding new colors and shades to help you with identifying plants and conditions. Have a great experience using Munsell Plant Tissue Charts? We’d like to know about it so we can improve the charts. As an expert in your field, you have the best perspective on what is needed to make the Munsell Plant Tissue Color Charts more effective and relevant. If you are using the Plant Tissue Color Charts, let us know how it should be improved. We hope you consider it a valuable tool and will take time to make it even better. If you are not familiar with the charts, let us know and we may be able to send one to you if you are a professional involved with determining types of plant tissue by color. We look forward to working with you to make identifying plants even more precise and accurate!